“Incomes” not rising, due to low crop prices and stagnating wages, has more than offset any “asset” gains in the recent period, which also probably explains the party’s heavy losses in the three states it ruled, Madhya Pradesh, Rajasthan and Chhattisgarh. The Modi government’s record in creation of assets and provision of amenities in rural areas is quite impressive. 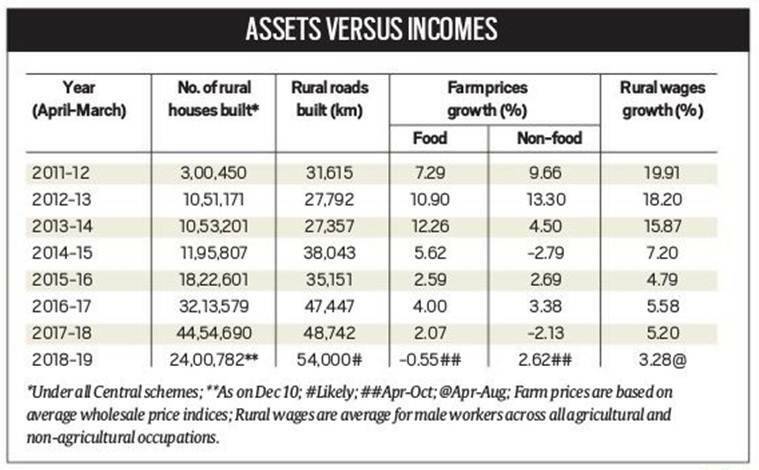 The big rural economy takeaway for the BJP from the just-concluded assembly elections is that mere asset creation — building roads, houses and toilets or providing access to electricity, LPG and broadband connectivity — isn’t enough. For rural voters, incomes count as much, if not more. * The total number of rural houses constructed since 2015-16 under Central schemes, including the Pradhan Mantri Awaas Yojana-Gramin, is 3.3 times that during the preceding four financial years. The last three fiscals alone (the current one still has 3.5 months left) have seen over 1 crore houses being built, with more than 27% of them in MP (15.43 lakh), Chhattisgarh (5.99 lakh) and Rajasthan (5.96 lakh). * The pace of rural road construction has significantly increased during this government’s tenure (see table). Currently, only 10.89% of habitations in MP having minimum 250 population are without pucca all-weather roads, whereas this ratio was 60.14% in April 2000. The proportion of such unconnected habitations has similarly fallen from 50.04% to 8.54% in Rajasthan and from 60.52% to 3.98% for Chhattisgarh. * The number of active domestic LPG connections has, thanks to the Pradhan Mantri Ujjwala Yojana, gone up from 15.33 crore in June 2015 to 24.72 crore in October 2018, with overall household penetration levels, too, rising from 57.86% to 88.51%. The states that have recorded substantially improved penetration during this period again include MP (from 39.12% to 73.49%), Chhattisgarh (27.63% to 71.23%) and Rajasthan (58.21% to 94.80%). * Of the country’s 21.69 crore rural households, 20.87 crore (96.24%) are now electrified. Under the Modi government’s Saubhagya scheme, launched on September 25, 2017, the number of un-electrified households has reduced from around 4 crore to just 81.53 lakh. MP and Chhattisgarh have already achieved 100% and 99.21% electrification, respectively, while it is 95.59% for Rajasthan. * More than 8.98 crore household toilets have been built in rural India since October 2, 2014 under the Swachh Bharat Mission-Gramin. Household toilet penetration is now 100% in MP, Rajasthan and Chhattisgarh, whereas the corresponding ratios for the three states before the programme began were 27.53%, 29.74% and 40.26%. * The BharatNet project has so far enabled laying of optic fibre cable lines in 121,859 out of India’s 2.5 lakh Gram Panchayats (GP). In 116,492 GPs, actual broadband connectivity through installation of equipment has taken place. * 33.38 crore bank accounts, with 19.75 crore of it in rural areas, have been opened under the Pradhan Mantri Jan-Dhan Yojana. However, all this asset creation work has not had the desired political impact – for the simple fact that the crisis in rural India today is primarily one of incomes. One indicator is crop prices. Since 2014-15, the average annual increase in the wholesale price index has been only 2.75% for “food articles” and 0.76% for “non-food” agricultural articles. As against this, the same during the preceding five-year period of the UPA government amounted to 12.26% and 11.04%, respectively, while higher than the average annual general wholesale inflation of 6.89%. In other words, along with lower income growth, farmers have also experienced deterioration in terms of trade. But it isn’t farmers alone. The table shows a marked decline in rural wage growth for agricultural and non-agricultural occupations after 2014-15, with the average yearly increase working out to about 5.2% in nominal terms. That is slightly above the corresponding rise of 4.9% in the rural consumer price index, pointing to a virtual stagnation in real rural wages. The reason here has partly to do with low crop prices, reducing the demand for farm labour. Moreover, a sluggish economy has led to a drying up of job opportunities for rural migrant workers, especially in sectors such as construction, real estate and manufacturing. This is in contrast to the UPA period, which witnessed double-digit rural wage growth on the back of a booming farm as well as non-farm economy. With incomes under stress – particularly in the post-demonetisation period, when crop prices have been more prone to falling than rising – it is not surprising that investing in public and household assets alone has not helped the ruling party’s electoral cause. It is one thing to provide free electricity or LPG connection to poor rural families. But without jobs and incomes, paying for power or refilling of the cylinder becomes that much more difficult.